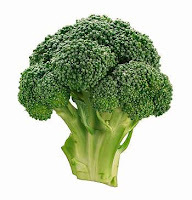 Broccoli is mainly grown in Arizona and California which I would not have suspected, since it is a vegetable that likes temperatures between 65 and 75 degrees Fahrenheit (18 to 23 degrees Celsius). It is related to the cabbage family and besides the clusters of flowers, the leaves also are edible and are very rich in nutrients. The taste is a mild combination of cabbage and cauliflower. Look for tightly, closed flowers and a lush, green color when purchasing this veggie. The stalks should be firm and the leaves should look fresh and green. An Antioxidant Super food, broccoli contains phytochemicals such as sulforaphane, glucosinolates and indole-3-carbinol, that may protect against prostate, bladder, colon, pancreatic, gastric, breast and other hormone-related cancers. A medium stalk of broccoli (148g) contains 45 calories and is an excellent source of vitamin C, folate, fiber and vitamin K, plus a good source of potassium, vitamin A, vitamin B6, riboflavin, manganese and phosphorous. In addition to many other bone healthy nutrients, broccoli contains one of the highest amounts of calcium among vegetables (7% of the Daily Value). The calcium alone makes it a Super food for your Bones. Broccoli's potent combination of antioxidants and nutrients also make it a Super food for your heart. Researchers have found that broccoli consumption strengthens a protective network of capillaries called the blood brain barrier—which protects the brain after head injury. I also read that it is not very wise to boil Broccoli, because it looses much of its health benefits and damages the anti cancer properties. It turns out that 77% of all the 'goodies' get lost while boiling this vegetable. Turns out that my grandfather was right when he mentioned that we throw away all the vitamins with the water we boiled them in. There are good alternatives for preparing Broccoli. Instead of boiling it, try stir-frying, steaming or microwaving it. These methods do not seem to have any negative effects on the healthy nutrients in the vegetable. I like to eat Broccoli raw and served with a dip, it makes for a great party snack. Try stir frying Broccoli with some other vegetables and chopped up chicken: it is an easy and delicious meal. The best way to keep Broccoli fresh is to store it in a plastic bag in the fridge. Not for too long though, it is always better to eat it soon after you buy it, so it will not whitter and you have to throw it out. The best way to gain knowledge, wisdom and understanding is through God's Words. Don't store it for too long though, it is always better to put that to good use soon after you gained it, so it can yield good fruit and be pleasing to our Father.